The traditional Greek octopus stifado recipe! We all know and love the classic Greek rabbit or beef stifado, but this very easy and simple to prepare octopus stew is the perfect dish for the Lenten period! Octopus is a lean seafood, low in calorie and very high in protein, making it a good way to substitute meat and get protein in your diet during Lent. To prepare a traditional Greek octopus stifado, the octopus is braised with wine, shallot onions, tomato, aromatic herbs and spices creating a delightful stew. Let it simmer to allow its flavours to mingle into something much much more! 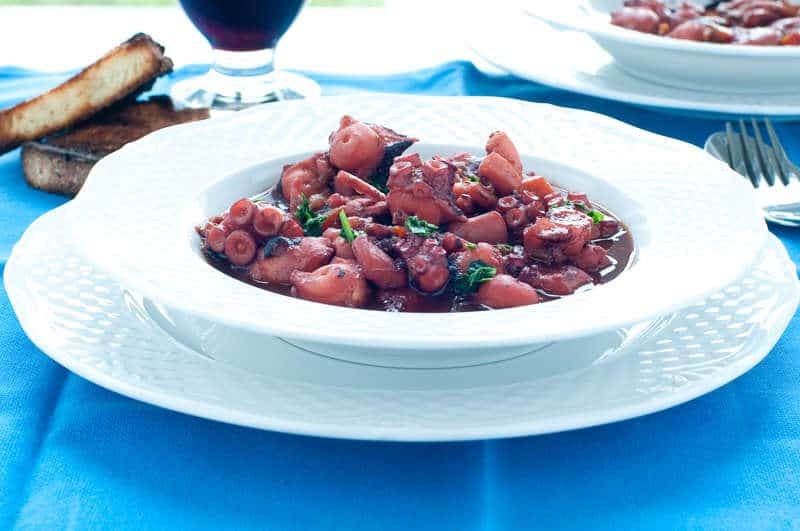 Serve this delicious Greek octopus stifado with fried potatoes or traditional Greek fava, some lovely crusty Greek bread and enjoy over a nice glass of wine or Retsina! To prepare this delicious Greek octopus stifado recipe, place the octopus in a large pot, pour in 1 cup of water and the vinegar. Boil the octopus for about 20 minutes. Remove the octopus from the pan, chop into pieces and place in a bowl along with 1 cup of the broth. In the meantime peel the shallots and carve them crosswise. A little trick to peel them more easily is to place the shallots in a bowl full of water and leave them in the fridge overnight. In a saucepan add the oil and shallots (whole) and sauté (medium heat) for about 10 minutes or until softened. Turn the heat up, add the octopus and sauté. Add the tomato paste, grated onion and garlic and sauté for 1 more minute. Pour in the red wine, 1 cup of the hot broth, the bay leaves, allspice berries and season. Bring to a boil, turn the heat down and let the octopus stifado simmer for about 30-40 minutes, or until the octopus is tender and the sauce has thickened. If the sauce needs some more thickening, then let it cook for a while uncovered. I’m going to try this tonight but I could only get a frozen octopus. Is the cooking time the same?